This has been one of those amazing, eye opening and emotional weeks. I returned this morning from Nairobi, Kenya, where you may have already read in previous posts, we have been helping to build a school in one of the informal settlements (slums) with funds raised from the sale of wall art. Around 60% of Nairobi's population live in slums, in shacks of around 10ft sq with little provision for basic services such as water, sanitation, drainage or electricity. Without formal recognition by the city they have few human rights and with lack of secure land tenure so many live in fear of eviction, knowing their home can be at risk of being bulldozed without warning. Cooking outside due to lack of space and risk of fire inside. Next to rubbish, not collected by the council. Cooking by open drains will become even more of a health risk when the monsoons start later in the month. It was my pleasure to meet with some very wonderful and motivated residents. People like Nancy and Julia who sell food on the streets inside the settlement, or Maxwell who was setting up a business to provide hot showers for public use. They are all part of the local economy and also part of a community federation Muungano Wa Wanavijiji who, supported by a local NGO Slum Dwellers International (SDI) Kenya, look at ways to mobilise change both by their collective actions and by lobbying local government to recognise them as citizens and provide services for them accordingly. After 5 years of running a school from a single room of a rented shack (see previous post) that was becoming difficult to afford and manage we purchased land for a new school to be built and they now have a new two roomed structure with toilets. Joseph is now in the process of registering the school with the authorities as a recognised informal school which is a great step forward. Informal schools are important to these communities for various reasons. Although the government does offer school places for all there are not enough spaces to go round. Those living on such low incomes can often not afford the obligatory school uniform which would prevent them attending. Or, possibly the main issue, the children from the slums will get bullied because of their situation so parents would prefer to school them locally. I visited the school for the first time with some friends from SDI Kenya. We were given such a heart warming welcome by the children and teachers accompanied plenty of singing and dancing. Above you'll also see one image of an empty piece of land. I've been asked by the community to help fundraise to buy this so that we can construct a two storey, eight roomed school with daycare centre. This is right next to the current school which would turn into an office space and kitchen. Joseph has great ideas of also being able to offer vocational training in the long term, sewing, woodwork etc. 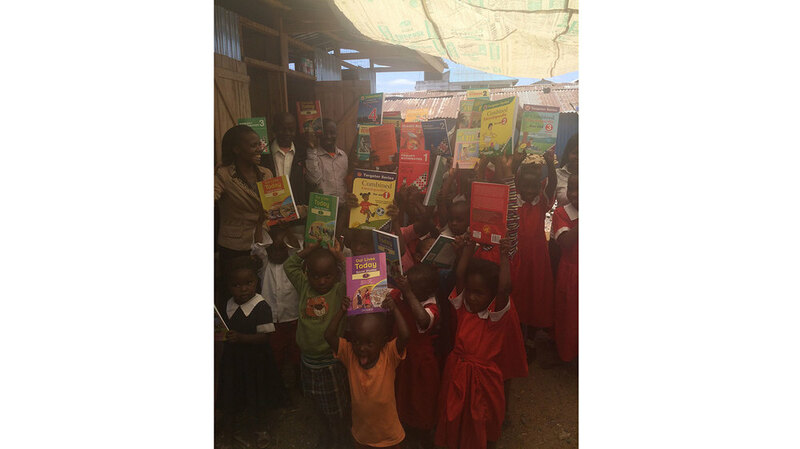 We are also really keen to try to work out how to set up a volunteer programme initially to help the children with their English skills as this is one area that sets middle class Kenyans apart from those living in the informal settlements and affects their future prospects. It's early days but hopes are high. We are now putting together a business plan for the school and other costings (the University of Tokyo have said they'll fund the construction which is amazing but we'll still be looking at fences, play equipment, desks, solar panels etc). If you would like to help you can donate or to be kep informed of future developments please email steph@stephanieray.co.uk to be added to the mailing list.